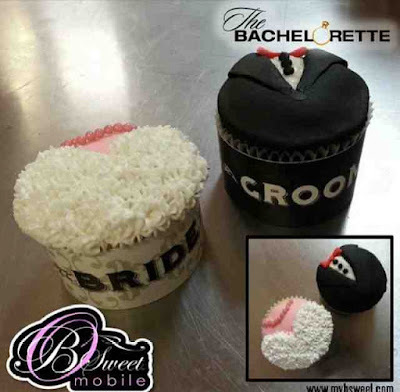 The Cupcake Activist: B Sweet Mobile Spotted on "The Bachelorette"
B Sweet Mobile Spotted on "The Bachelorette"
I'm going to admit something I thought I never would: my husband watches "The Bachelorette." And since the TV is on, I watch it too. 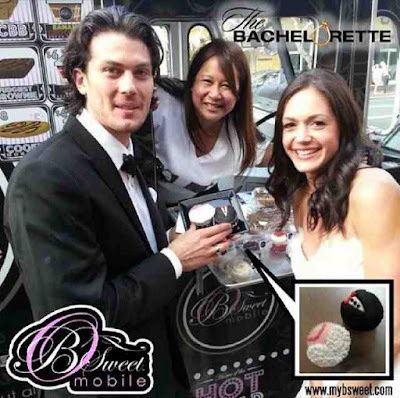 While Desiree was on her first one-on-one date with Brooks, I was surprised to spot B Sweet Catering on the show. I first discovered B Sweet Catering two years ago when I got the amazing opportunity to tour their kitchen and taste their treats (full post here). Since then, B Sweet has been roaming the streets of LA in their own dessert truck. The episode didn't expand much on what they ordered at B Sweet, but I later found photos on Barb's B Sweet Instagram. Desiree and Brooks received special bride and groom cupcakes from B Sweet Mobile truck. So cute! Continuing coverage of the event extended to the next day when Barb and her truck were featured on E! News. How exciting for her! Congrats Barb and B Sweet!